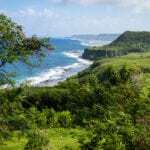 The Chamoro people have been living on Guam for over 4,000 years. Yes! Magazine’s Bailey Williams speaks with Dr. Greg Santos Perez, a Chamoro Poet, about the impact of colonization and efforts to save a culture and a language.